When you listen to rhythmic sounds, your body, brainwaves, and energy centers begin to vibrate in response. Healing Rhythms: Music for Dynamic Meditation and Vibrational Healing is designed to utilize the healing power of rhythm to promote health and wellbeing. It applies the principles of resonance to restore the vibrational integrity of body, mind, and spirit. The various sympathetic resonances that this CD produces with drums, flutes, and the human voice will help open your body's energy pathways, promote healing, and stimulate creative expression. You can use this CD to improve your meditation practice, release stress, feel more vibrant, or experience deeper self-awareness. This is music you listen to with your whole being. Open your heart, empty your mind, surrender to the power of the rhythm as it saturates your body, and let your body move freely. Each track presents a unique experience of healing rhythm—simply relax and allow it to move through you! He realized that the music he had been pursuing flows from Korea's ancient Sundo traditions, and, since then, he has been promoting health, wellbeing, and spirituality through music and sound. Sun Poong is the CEO of Poongryudo, which offers a system of mind/body training programs based on the traditional music of Korea, and is Director of the Ilchi Art Hall in Seoul, South Korea. 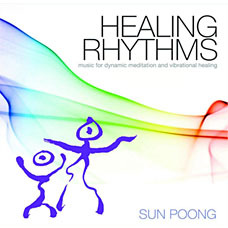 In this album, Sun Poong conveys the essence of healing through rhythm that has been accumulated through more than 300 performances and workshops over 15 years. * This CD should be regarded as a reference source and is not intended to replace professional medical service in any means. The author and the publisher disclaim any liability arising directly or indirectly from the use of this CD. Healing Rhythms: Music for Dynamic Meditation and Vibrational Healing is designed to utilize the healing power of rhythm to promote health and wellbeing. It applies the principles of resonance to restore the vibrational integrity of body, mind, and spirit.